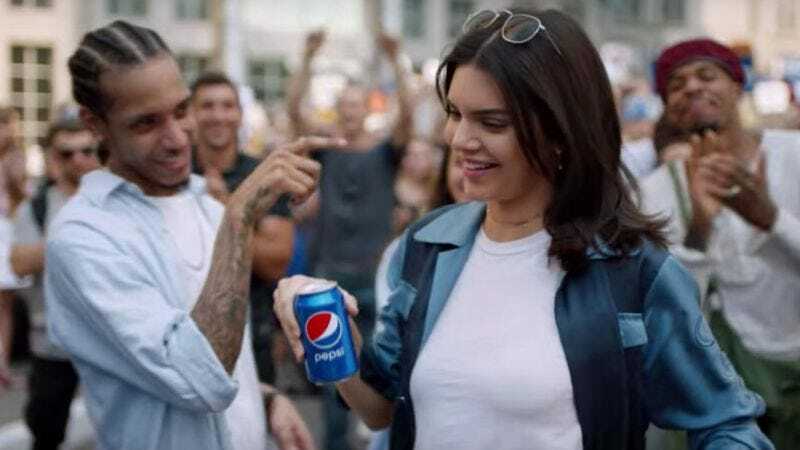 In a desperate bid to compete with a decades-old Coca Cola campaign, Pepsi rolled out an ad yesterday that featured former Kardashian hanger-on and current runway model Kendall Jenner as the perfectly airbrushed face of the Resistance. It met with immediate online ridicule, featuring as it did Jenner taking a break from a high-paying gig to rub elbows with the hoi polloi, but also empathize with the police decked out in full riot gear. Faded denim and shared beverages aside, it was a cynical attempt to capitalize on the current political discourse in this country, a fact that was not lost on the denizens of the internet. Jenner and Pepsi were dragged for what some described as tone deafness, and others saw as something far more insidious, presumably because no one was on hand to defuse the matter with a red, white, and blue can of corn syrup. Well, Pepsi has heard the criticism, and has responded by pulling the ad and preventing “further rollout.” There’s no word on whether this was the first in a series of commercials that ultimately lead to Jenner joining the police academy, and graduating to unleashing a Pepsi-filled fire hose on protestors. But Pepsi is sorry if anyone was offended, and especially remorseful of Jenner’s implication in this whole mess. It’s hard to see what global unity there was at the center of an ad that had such clear lines of division among the marginalized groups protesting, the rich woman who dabbles in social justice, and the armed police officers. Obviously, Pepsi should have hired Don Draper for this new campaign.